Votes can only register via two online methods; the main voting form available on the British Travel Awards website from 1st July - 30th September and a nominee’s direct voting app. With 83 award categories, the main voting form can be a daunting document to navigate. We have designed the form to make the user experience as easy as possible. It allows selective access to all categories rather than having to scroll through the entire voting form. 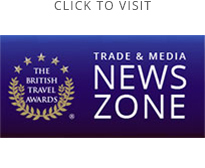 Register contact details on the British Travel Awards website and submit. Navigate and select from category sectors. Category sectors concertina up and sector award categories concertina down. Navigate and select from award categories. Award categories concertina up and category nominees concertina down. Click vote button next to chosen nominee or type alternative answer. Voter then has the option to vote in additional categories by repeating steps 2 - 4 for each category. Answer or skip TravelVision 2020 survey. Register contact details, vote for nominee in their elected categories and submit votes. A voter can only register once. If they try to register again, a message will open advising them that they have already registered with a link to the log-in section on the main voting form. From there they will be required to enter their registered email address and unique password; then work through steps 2 - 6 on the main voting form to add to or amend their original votes.